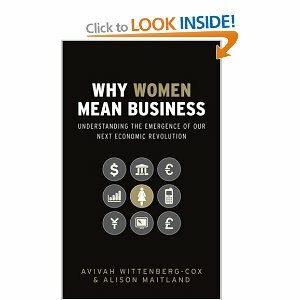 Why Women Mean Business is probably the most frequently referenced book in my library! It was published in 2008 by John Wiley & Sons and written by Avivah Wittenberg-Cox and Alison Maitland. Well done them! If you are in business at all, male of female, I recommend this book to you. If you are a woman looking to move on, I recommend this book to you. If you are an academic studying gender issues, I recommend this book to you. And if you’d like a sound economic case as to why women should be properly catered for in today’s workplaces, I recommend this book to you. You will have gathered by now that I thoroughly recommend this book! It is a well researched account of some of the issues women face at the top of organisations. But it’s not a rant or a moan. It’s also a guide on how to remedy them, packed full of useful advice, facts, statistics and case studies. It makes the business case for women in senior roles, not simply an ethical one. And it’s eminently readable. Here’s an extract from Chapter 5 ‘Seven Steps to Successful Implementation’. The concept of being bilingual is not a new one but it is a good one. I have heard of it previously called bi cultural and to have a foot in both cultures. I like the foot version it’s a reminder that we have to build bridges to cross the gaps. Many thanks Sarah. Still a few bridges to cross, little by little…..